Intel’s P35 was shown off everywhere at CeBIT, but new information won’t arrive again until the P35 is officially launched in Q3. It is the performance-mainstream chipset equivalent to the P965 and it will support DDR2 up to 800MHz and DDR3 up to 1066MHz. In addition, it'll support the new 1333MHz FSB processors and future 45nm Penryn based chips too. It still only features one PCI-Express x16 slot and CrossFire models will be still x16 and x4, which very much cripples the multi-GPU performance like it does on P965. 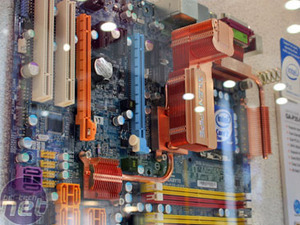 Since the DDR3 uptake is predicted to be small at best this year, motherboard manufacturers were showing off two or three motherboard iterations of P35 with either DDR2 / DDR3 only or a combination of both. 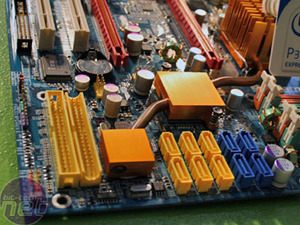 The combination offers an upgrade future without having to buy a new board, but a motherboard with one type of memory slot can be tuned for better general performance and overclocking. The X38 chipset will be the successor to the long running 975X chipset as an entry level workstation and performance gaming chipset and it will be the first chipset to support the new PCI-Express 2.0 specification if Intel has its way. X38 will feature two full bandwidth x16 slots with CrossFire support but will only support DDR3 – there’s no love for DDR2 here. It’s expected to arrive on a slightly larger 40mm package (as opposed to 34mm for the other Bearlake series chipsets) and it’s tipped to be the one to wait for if you’re interested in gaming and overclocking. The only real downside at this early stage is that you’re going to have to invest in DDR3 memory, which is undoubtedly going to be expensive. G35 and G33 are due out in Q2 and are listed as ‘performance’ integrated graphics chipsets. They will offer two new and improved graphics cores, as well as support for 1333MHz FSB and 45nm processors. The G35 chipset is due out first and will be DirectX 10 compliant, although no details on its core as a unified shader part are available. Digital Video output is still supplied through an extra add in board and memory support is limited to DDR2-800. G33 will be out slightly later, but will include DDR3 support and is tailored towards video with Intel’s Clear Video Technology being a key feature. The ICH9 southbridge family now comes in a few flavours: ICH9, ICH9DH and ICH9DO. All iterations of the southbridge support twelve USB ports, six PCI-Express x1 ports, six SATA 3Gbps ports with eSATA and Matrix RAID support, Intel HD Audio and a single PATA port. The ICH9DH supports Intel’s Viiv initiative, while the ICH9DO is more business focused and labelled under vPro. Currently, there are no details on the northbridge-southbridge interlink bandwidth – we may learn some more about this in the run up to the chipset’s official launch later this year. Gigabyte’s GA-P35-DQ6 has some of the craziest heatpipes we’ve ever seen. 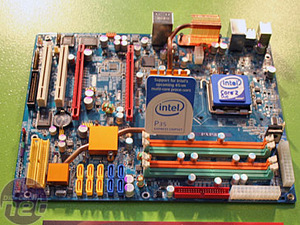 There are two PCI-Express x16 slots on the board and they include support for CrossFire. 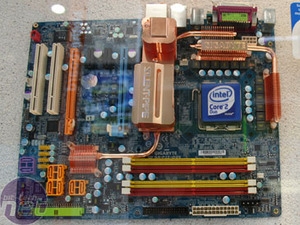 In addition, there are two PCI slots and eight SATA 3Gbps ports. Gigabyte also seems to be pessimistic about the uptake of DDR3 and considering the current penetration of DDR2, the company has quite wisely only supported DDR2 on its top of the range DQ6 model. 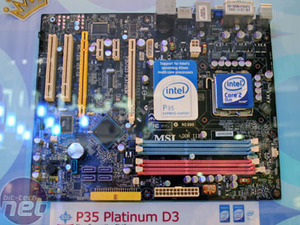 MSI’s P35 boards will come in two flavours with the P35 Platinum supporting DDR2 and, not surprisingly, the P35 Platinum D3 features DDR3 support. There are some minor changes in design between the boards, but they are essentially the same P35/ICH9DH chipset combination and both feature six SATA ports with five internal 3Gbps and one eSATA port and CrossFire support. 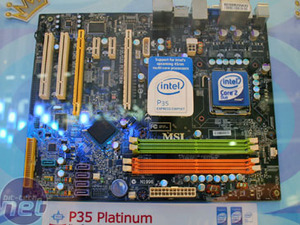 Albatron’s first P35 board, dubbed the PXP35, is devoid of any PCI-Express x1 slots but it still has two PCI slots and two PCI-Express x16 slots for CrossFire. Interestingly though, disk drive connectivity is through the roof with ten SATA ports and three IDE ports.